Electric violinists Linzi Stoppard and Ben Lee comprise FUSE, and they're wowing music lovers with an innovative and one-of-a-kind sound that's unlike any other. The FUSE violin duo released their debut album, FUSE, with Edel AG Records and their faithful following has been growing by leaps and bounds ever since. As part of the FUSE violin duo, Linzi Stoppard and Ben Lee are carving out a unique musical niche and an equally unique fan base with their incredible sound. Violins are traditionally associated with classical music, but the FUSE electric violin duo has bucked the norm. They delved into the sometimes risky and uncharted territory that is the world of crossover music to develop a new, innovative sound; one that's unique on the music scene. “Many string instruments have electric varieties, but these musicians typically use a traditional acoustic instrument so you end up with a traditional sound, albeit a bit louder. Our approach is very different. We utilize sonic processors and a unique type of electric violin. To achieve their trademark sound, the electric violinists of FUSE called upon a suite of high-tech equipment, including their trademark gold Bridge electric violins, valve amps and sonic processors to create their trailblazing album. The result is a new style of rock that's unlike anything you've ever heard. The FUSE violin duo has received tremendous critical acclaim from critics with some of the world's leading publications, including the Daily Telegraph, the Daily Mail, OK Magazine, and Hello Magazine, among others. But Linzi Stoppard and Ben Lee don't just have the talent and the innovative sound; they've also got the look. Up until 2007 I was a solo electric violinist performing all over the world. As with most artists I was always looking to push the boundaries a bit further so my management started looking for an executive producer to work with me behind-the-scenes. Meeting Ben I think was serendipity – my management found him through old contacts and being passed from one person to another and eventually Ben was at the end of the chain. To begin with Ben worked with me as my exec show producer because he was a wonderful talent on the violin so had an innate taste for what I as already doing, and had good studio credentials as well. This works really well for about 6 to 9 months and then out of nowhere one day in rehearsals we were arranging a piece that would really have benefited from having two live violin lines playing at the same time – like a conversation if you will. That was the moment! I thought, well there's only one way to do this and that’s to invite Ben to play the second line with me so I did and asked him to come to the next show to perform it with me. One track led to another and within a few weeks we had re-arranged and reproduced my tracks so that it accommodated two violins and FUSE was born. 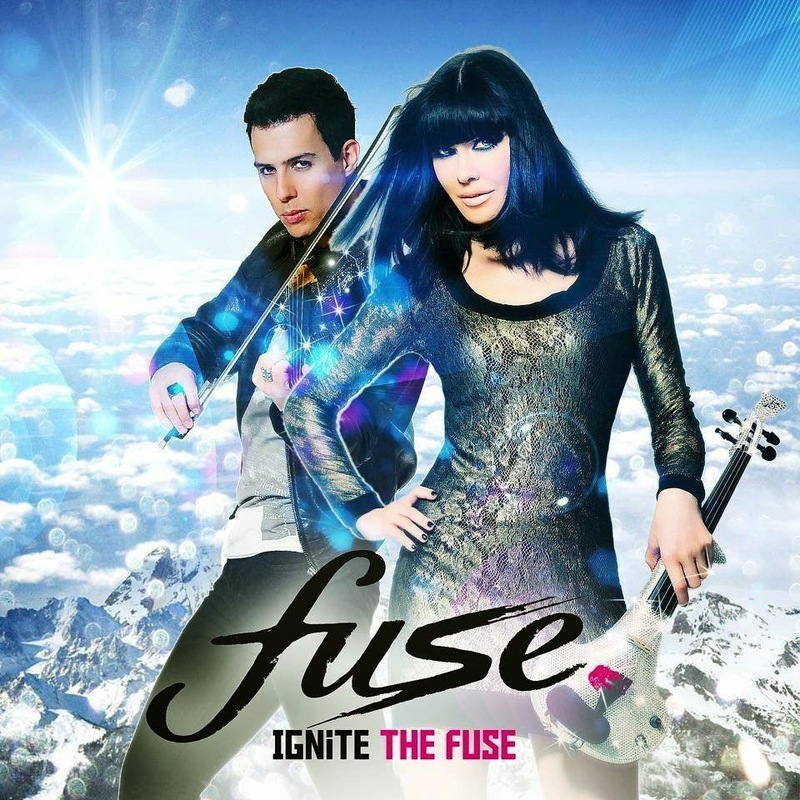 What's the story behind the name "Linzi Stoppard & FUSE Violin Band"? When it comes to choosing a name bands I think find it inherently difficult because whatever you think of you doubt yourself whether it fits the image, style, the music and what others will think of it as well. We knew what we were trying to achieve as a band – it was an amalgamation of lots of different influences from Ben's childhood, from my childhood, from the music we grew up listening to and also trying to convey that we were combining a classical instruments but with a much more contemporary approach. The word of fusion kept coming up over and over again but we thought it sounded a bit clinical and there may have been another band around at that time with the same name. So FUSE seemed a lot more punchy, less syllables which helps, and encapsulated everything we wanted the name to represent. Typically, most violinists play acoustically, but you choose to perform using processors and electric violins. Was it to be different or do you prefer this style of violin? Yes, we get asked this quite a lot. I suppose it's a bit of both – when I look back I suppose, the common denominator is I've always wanted to do something a little bit different from the crowd and to stand out. This was not because I didn't admire what other people are doing, I did, I just wanted to be a little bit different. When I was a solo artist we did experiment with different approaches to my live performance and some included classical violin and also with the electric violin but I always felt live at the electric violin showcased my vision and sound for the artist I wanted to be. Then of course working with Ben in early 2008 open up a new horizon because he was practiced at using effects like me, pedals, and several guitar techniques transpose for the violin. That was actually the easiest decision, we had the same goals, ambition, and both wanted to show how versatile the electric violin could be if you had an open minded approach. When it came to recording the album we decided to use a lot of analog equipment - not just vintage guitar amps but also down to specific details like the model of microphones that were used back in the 1970s to capture that full rich sound. This backline combined with the modern production techniques we feel has given us a signature sound and helps capture the audiences attention because it's not just an electric violin playing straight through a live desk that really sounds more or less like an acoustic violin amplified. How do you write and create each of the songs? This has been a collaborative process – not just between Ben and myself as you would think but also with our management. They always have one eye on what is commercially viable and it helps us keep our focus on the goal and not get too self-indulgent going off in some weird and wonderful direction which to us seems fantastic but may result in leaving the audience behind. Four example the track Fix You on our Universal album was imagined up by our manager while he was on holiday. He didn't have any fancy software like ProTools or Logic, but he had a very rudimentary program that could chop up tracks – he cut up the Welsh lullaby theme from the film Empire of the Sun and tried to stitch it together with Coldplay's Fix You. To be honest it sounded pretty awful but the kernel of the idea was definitely there and when Ben and I heard it we knew exactly what he was after. I remember when we finished recording that track Ben turning to our manager and asking, “Is this how you imagined it would sound when you first had the idea?" The manager was absolutely thrilled with the end result. As a general rule for our rock anthems album we purposefully choose tracks that are very familiar and people know the lyrics to. Then we transpose the lyrics into a dual violin line (like a conversation between Ben and I) and keep it as the main melody of the track – hence when people are singing the lyrics in their mind we are playing along with the same melody and we believed this would end up a key USP of the band. Which it did. Then to take it one stage further now and then to underpin the hook of the track by adding some BV's to thicken up the soup! Let's talk about influences. Who influenced each of you? As a child I had many influences from either end of the spectrum. My mum was a classical lover so I had a strong classical influence growing up. At the other end my father loved his rock music – ranging from bands like Led Zepplin, Free, Deep Purple and Bad Company… going back to one of your previous questions I am sure this influenced mine and FUSE's decision to go back to those hallowed days and recreate that immense analogue rock sound. Growing up in 80s with the major artists of the time were a big influence to me too - whether it be more on the pop side like Madonna and Prince through to the big stadium bands like Def Leppard. So the classical and the rock music got amalgamated and out the other end emerged FUSE. If you were to compare your music to anyone, who would it be? That's a difficult one because you can't really compare ourselves to a vocal artist, and on the other hand we believe as a violin act we have marked differences between us and our contemporaries. Having said that there artist we admire such as Nigel Kennedy, Vanessa Mae, and of course Bond who all paved the way for us. Your music would be amazing in television or film. Have you ever been commissioned to score any such projects, if so which ones? That's a timely question… we are currently in talks to do two film scores. The first will require a bit of reinvention as it's very contemporary and modern so it will need a special team of producers. I suspect we won't end up using the violin in the traditional sense but rather as a module for trying all sorts of weird and wonderful sounds through it, like you would with a synthesizer. This will give it a unique identity that can only be achieved from using a string instrument and a bow. The other will be a much more traditional film score with large orchestral movements and very cinematic. There is such emotion in your music. Does your own music ever bring you to tears? Yes it's can be very emotional but no it hasn't brought us to tears yet. But seeing fans welling up which does happen now and then, is very moving and without them saying anything we know we have struck a chord and made a deep connection with them which is always very gratifying. I know some of your music does incorporate background vocals, but have you ever collaborated with other vocal artists from other bands? Is that something you'd like to pursue more of? As I mentioned earlier we do sometimes include backing vocals in the choruses to emphasise the hooks that everyone knows and loves, and enjoys singing along to. This was another USP and character of FUSE that we decided early on in the making of our rock anthems album. We have been approached by a couple of vocal artists but for one reason or another the projects didn't pan out because the material felt a bit forced and wasn't coming naturally. But yes, this is definitely something that we are open to and I'm sure it won't be too long until we produce something with another artist. Because you're a unique instrumental artist, do you find it more challenging or an advantage over most independent vocal artists, because there are so many of them? It depends how you look at it – either the glass is half full, or the glass is half empty. Yes there are more independent vocal acts out there which means that it's more competitive but it also means that that is the mainstream choice of music so it has greater support from the record companies, the media, and understandably radio. It is true there are fewer violin at around but because it is still perceived a niche instruments it doesn't have the visibility or airtime to breakthrough like a new boy band would. Having said that there is an increasing number of string acts around. You just have to look on YouTube and there seems to be a new one every week which wasn't the trend 5, 6, 7 years ago when we started out. Now there is a plethora which in a way is a good thing because it challenges us to be even more innovative and to try and get ahead of the curve. I always believed that competition was healthy - my motto is "if you thought you were doing okay it meant you were comparing yourself to the wrong people." What is in store for Linzi Stoppard & FUSE Violin Band for 2014 and beyond? New music? New video? A tour perhaps? Hopefully a soundtrack, either one would be great but we are constantly in the studio trying out different ideas between being on the road touring, and launching products like the new Mercedes S Class we toured with earlier in the year. FUSE doesn't do "standing still" very well. Learning to play electrical fiddle shares several similarities with finding out acoustic fiddle, with many vital variations. the primary is that just about each acoustic fiddle is formed and tuned an equivalent method.